People often ask me if you can make decent money trading on the Stock Exchange of Thailand (SET). The short answer is yes. In this article I will discuss how it was possible to make more than 360% profit in less than 4 months trading a Thai call warrant. What is a Thai Call Warrant? A call warrant is a derivative financial instrument that gives the holder the right (but not the obligation) to buy an underlying share at a certain price on or before a specific date in the future. Thai call warrants may be issued by the underlying company itself, or they may be issued by a third party such as a broker. Call warrants issued by the underlying company are usually listed publicly on the SET and anyone can purchase them via their Thai trading account. Call warrants issued by a third party, such as a broker, may only be made available for purchase by its own clients. Although I do not refer to them in the remainder of this article, please note that put warrants can also be issued by a company or a third party. A Thai put warrant gives the holder the right to “sell” the underlying share at a certain price on or before a specific date in the future. Two essential features of a Thai call warrant are its expiry date and its exercise price. Expiry date: This term can have a different meaning depending the exercise style of the warrant. There are two common exercise styles: American, were the warrant can be executed on or before the expiry date, and European, where the warrant can only be executed once on its date of expiration. Both of these exercise styles are used in Thailand. Exercise price: This is the specified amount that must be paid by the holder of a warrant to obtain the underlying share. A Thai call warrant may be referred to as In The Money (ITM) or Out of the Money (OTM) depending upon its prevailing intrinsic value. A key factor influencing the market price of a call warrant, intrinsic value is always greater than or equal to zero and represents the difference between the exercise price and the current market price of the underlying share. A Thai call warrant is ITM when its exercise price is lower than the current market price of the underlying share. For example, if an investor holds a warrant with an exercise price of 5 Baht and the underlying share is currently trading at 7 Baht, that person has an ITM warrant with an intrinsic value of 2 Baht. Conversely, a Thai call warrant is OTM when the exercise price is higher than the current market value of the underlying share. Using the same example above, if the underlying share was trading at 3 Baht, the investor would be holding an OTM warrant with an intrinsic value of zero. A Thai call warrant is a leveraged instrument. They provide an investor with a way to control a larger amount of shares using less capital than if he or she purchased those shares directly. Put simply, the price of a warrant is less than the price of the underlying share. The advantage of buying Thai call warrants is that they offer the potential for a larger capital gain than what might be achieved holding the underlying share directly. But leverage works both ways, in a falling market the holder of a Thai call warrant will also suffer a larger capital loss. While it is common for the price graphs of an underlying share and its call warrant to move in parallel, the percentage gain, or loss, varies significantly. The leverage of a warrant is contingent upon its exercise price and its exercise ratio. Upon execution, some warrants entitle the holder to receive more than one underlying share. For example, if a warrant has a exercise ration of 1:1.1, an investor holding 1000 of those warrants is entitled to receive 1100 of the underlying shares. The primary risk arising from a call warrant is the fact that it has a shelf life. Its market price can fall to zero if there is no expectation that it will be ITM prior to its expiry date. A secondary risk also arises where a call warrant is issued by a third party such as a broker. The issuer might go bust and so may not be able to meet its future financial obligations regarding the warrant. The Thai call warrant that I want to discuss in detail with you is called JAS-W3. Before we examine the warrant however, let us first have a look at the underlying company that issued it. Jasmine International (JAS) is a telecom business incorporating broadband, network, and system integration product and service offerings. In 2015, from the start of April until the end of October, its market price channeled between 5 Baht and 6 Baht. During November and December the Thai government required Thai telecoms to bid for the rights to new bandwidth licenses via an auction. Bidding at the auction was fierce. JAS secured a 900MHz license but had to pay a bid price of 75.654 Billion Baht (plus sales tax of 7%) which, at current exchange rates, is the equivalent of about USD 2.4 billion. There was a lot of speculation in the Thai media that JAS had paid too much for the license and that moving forward the company would therefore have problems maintaining profitability and dividend payments. Around the same time, there was also a good deal of speculation in the world media that, in America, the Federal Bank would commence raising interest rates. Emerging markets such as the SET suffered from foreign capital outflows as money was repatriated back into USD in anticipation of increasing yields. 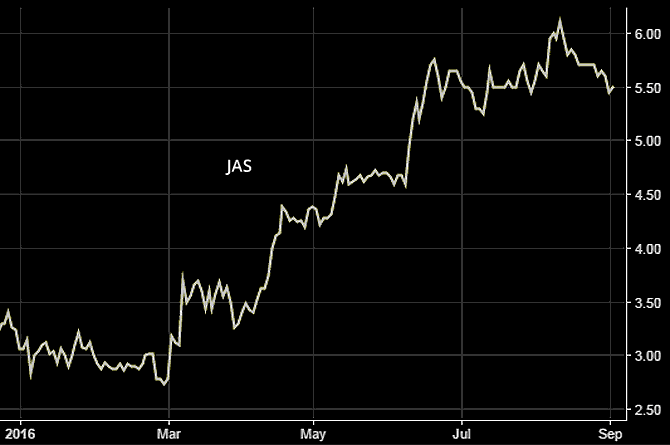 By the start 2016, the market price of JAS had fallen some 50%. On 7 January it closed at 2.84 Baht per share. As one might expect, as the price of JAS shares dropped, so too did the price of JAS-W3. However, expressed as a percentage, the drop suffered by JAS-W3 was much more severe. The warrant first listed on the SET on 16 July 2015 and its price at the close of market was 1.55 Baht. By the start of 2016 the price of the warrant had fallen to below 0.4 Baht, a decline of more than 70%. At the start of January this year, JAS-W3 was OTM, and so had an intrinsic value (and theoretical market price) of zero, but I was comfortable that it was still a solid buy at or below 0.45 Baht. The market price of the underlying company, JAS, had, in my view, fallen dramatically in response to ongoing negative media speculation, not because of poor company management or other internal factors. Sure, JAS had paid a fortune for its new bandwidth license, but so did all of the other Thai telecoms that were also required to bid to secure their licenses at the auction. Back then, I also could not see how the FED could pull the trigger on a rate increase in the US unless it actually wanted to crash the DOW. There was potential for a healthy profit in the event that the negative media speculation, about JAS in Thailand and the about a rate rise in America, proved ill informed. I also liked JAS-W3 because the primary warrant related risk, shelf life, was low. The expiry date for the warrant is 3 July 2020. A date that far into the future affords one a lot of wiggle room to exit a trade. JAS-W3 was issued by JAS itself and so there is no secondary risk arising from a third party issuer. Moreover, because the warrant was issued by its underlying company, and not a broker, it could be purchased by anyone with a Thai trading account. That helps to ensure healthier intra day trading volumes making the warrant easier to buy and sell. You can see from the price graph above that at the start of this year there was a 2 month window wherein it was possible to accumulate JAS-W3 at or below 0.45 Baht. At the end of March, JAS announced that it could not secure loans sufficient to honor its bid on the 900MHz license, and that forfeiting the 644 million Baht deposit it had paid to participate in the auction would not significantly affect the its financial position. Around the same time, it also became clear that the rate hikes adumbrated by FED were not going to happen and yield seeking foreign capital therefore began flowing back into the SET and other emerging markets. 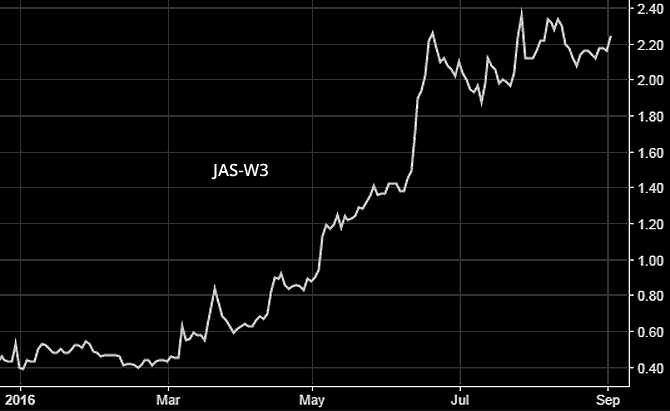 JAS shares rallied strongly for 3 months, with JAS-W3 moving in parallel, and then, at the end of June, a window opened to sell the warrant at 2.1 Baht. In percentage terms that equates to a profit of 366%. If you are a better trader than me, you might have been able to cherry pick your buy and sell prices. During January and February there where a several days where you could have bought JAS-W3 for less than 0.4 Baht, and in August there was an opportunity to sell for 2.4 Baht. In percentage terms that equates to a profit of 500%. So there you have it, a recent working example of how it is possible to make a profit of more than 360% in less than 4 months trading a Thai call warrant. And, for those readers who did not already know, the Thai government does not levy any tax upon a capital gain made by a foreigner (non-Thai) trading on the SET. With the objective of keeping this discussion as simple as possible, I have, until now, omitted any reference to non-voting depository receipts. NVDR are an instrument created by the SET to stimulate foreign trading activity. If you are a foreigner and intend to commence trading Thai warrants, it is essential that you first read my previous article: What are NVDR, (F) shares, and (L) shares? Before you place a buy order, you should always check if a NVDR version of your targeted warrant is available. NVDR warrant codes include a (-R) suffix. For example, the NVDR for JAS-W3 is JAS-W3-R. Your comments or feedback on this article are welcomed. 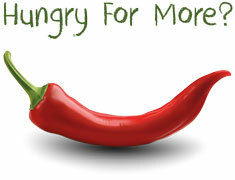 If you want to discuss and learn more about trading Thai warrants please visit our forums. If you have a specific question you can post it as a new topic.